The UN Security Council is due to vote on extending the MINURSO mandate before the end of October. In the light of continuing human rights abuses in occupied Western Sahara, yet again, WSC together with human rights and solidarity groups from around the world have called on the UNSC to include human rights monitoring in the MINURSO mandate. I would like to inform you that nearly every one of the projects being constructed in the region of Fos BouCraa employs only people of Moroccan origin. Nearly 52 companies engaged in installation of equipment, construction, cleaning and maintenance employ less than 1% of Saharawis in their workforce. Saharawis are marginalised away from decision-making positions such as directors unless they subscribe to the Moroccan position. Morocco has no will to put an end to this old conflict. Saharawi activists are tightly controlled by the authorities. We live in a closed prison, the world closes its eyes to what is happening or is a faithful partner of colonisation in order to benefit from it. The problem is that Europe should come down to the Sahara and experience the conditions here and see the conditions of the refugee camps in Tindouf, that way they could take a reasonable and logical decision. France always sings the slogans of the republic: liberty, equality, fraternity so how can it justify the veto on human rights monitoring in Western Sahara. It is a two-faced game. We want Europe to know that there is no stability in the region without respect for the Saharawi people. As representatives of human rights organisations, civil society, and solidarity groups from around the world, we are writing to you . . to place on record our strong belief that the status quo in Western Sahara is unacceptable.
. . . The basic principles at stake are simple and fundamental. The right to self-determination is enshrined in the UN Charter and is the foundation on which MINURSO’s mission was built. The failure of the Security Council to move the political process forward and pressure Morocco to act in good faith has enabled a political impasse in Western Sahara that tarnishes the reputation and credibility of the United Nations and its peacekeeping missions. We . . . call on you to act with due urgency to support the right of the people of Western Sahara to choose their own political future. This will require political will and bravery by members of the Security Council, but it is no less than the Saharawi people have been promised and deserve. Read the letter and signatories here. Independent, impartial, comprehensive and sustained human rights monitoring must be a central element of the UN’s future presence in Western Sahara and Sahrawi refugee camps, Amnesty International said today, calling on the UN Security Council to strengthen the UN Mission for the Referendum in Western Sahara (MINURSO) by adding human rights monitoring and reporting to its mandate. The UN Security Council is due to vote on extending the mandate of MINURSO on 29 October. It is the only modern UN peacekeeping mission without a human rights mandate. Human rights abuses have been committed by both sides . . . in the more than 40-year dispute over the territory. 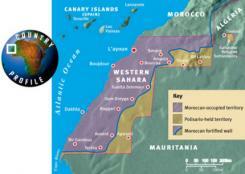 Over the past year, Amnesty International has continued to document human rights violations in Western Sahara, including arbitrary restrictions on peaceful assembly and freedom of expression and arbitrary and abusive force against protesters and activists supporting self-determination for Western Sahara. From 28 June to 1 July, Horst Köhler, the UN special envoy for Western Sahara visited the region, holding meetings in Laayoune, Smara and Dakhla to push for the resumption of negotiations between the parties. During his visit, peaceful protests by pro self-determination activists were violently dispersed by Moroccan security forces. In a video of events on 28 June assessed by Amnesty International, at least 12 Moroccan police officers are seen violently dispersing a peaceful protest in Laayoune on the day of the visit by Horst Köhler. The video shows about 30 protesters holding flags and chanting slogans calling for self-determination being dispersed by police officers who push at least two women to the ground. The video also shows a Western Sahara flag being taken by force by police from another women's hand while another's veil is taken off and at least two men are beaten. According to the president of the Sahrawi Association of Victims of Grave Human Rights (ASVDH), one ASVDH member covering the protests filed a complaint after she was beaten. Her camera was taken away by security forces and never returned. Read the AI press release here. In spite of having multiple reasons against the deal - including an EU Court ruling - the rapporteur of the European Parliament's Agriculture Committee recommends Parliament to consent to including Western Sahara in the EU-Morocco trade deal. New York, October 13, 2018 (SPS) - The United Nations (UN) Security Council, which met Thursday in New York, reiterated its strong support to the UN Envoy for Western Sahara, Horst Kohler to hold the first round of direct negotiations between the Polisario Front and Morocco in Geneva, and called the two sides to engage in these talks in good faith and without preconditions. The Security Council expressed unanimous support to Kohler who intends to invite both sides for negotiations in Geneva, a close source told APS following an in camera meeting on the MINURSO (United Nations Mission for the Referendum on Self-determination in Western Sahara), held in New York. According to observers, this support is important to Kohler whose role will not be decisive without the Security Council’s support. The statements made by the Security Council members stress the need for both parties to engage in negotiations in good faith and without preconditions. The members of the Security Council also emphasized the importance of the MINURSO as a mechanism of conflict prevention that contributes to regional stability. The Thursday meeting preceding the traditional annual discussions on the renewal of the Mission's mandate was devoted to the presentation of the new report of the United Nations Secretary-General, Antonio Guterres on Western Sahara.